Robert Sorby have introduced a small sanding unit with adjustable head to reach places other units cannot. The Modular Micro sanding unit can be supplied handled or unhandled, with the handled version boasting a slick burgundy anodised aluminium handle. 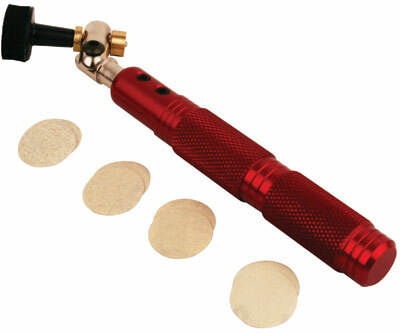 The sanding unit itself has a 25mm sanding head, with hooks, which are able to accept loop-backed abrasives. These can then be adjusted to a variety of angles to access the work as necessary. It has a bushing arrangement, which holds the head steady and allows it to spin when presented to the work. It is also designed for small-scale work or, for accessing work with a restricted opening. The locking method allows for ease of use, and enables you to reach difficult areas, such as the interior of the hollow form. The tool is supplied with 8 discs of various grit grades, which can be used straight from the pack, and once the unit is in contact with the work. The sanding head rotates smoothly and by moving the unit across the work, allows for even and efficient sanding. This unit is smart looking, simple to use and delivers exactly what it promises. From the short time I have been using it, I have found it to work very well. 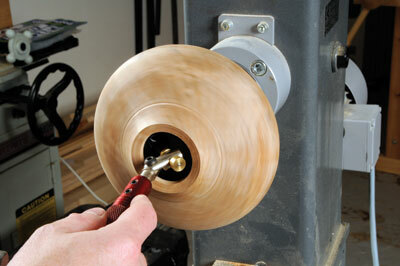 It puts up with the rough and tumble of everyday turning, and is a very handy item to have to aid hollow form sanding. For more information, and for a look at other equally useful tools and micro tools, take a look at the Robert Sorby website or catalogue. "This unit is smart looking, simple to use and delivers exactly what it promises"